Many of us looked forward to the days when a substitute teacher filled in. Substitute teachers usually meant class was put on hold in favor of watching videos! From Bill Nye the Science Guy to The Magic School Bus and The Voyage of the Mimi, we always looked forward to binge-watching videos on substitute teacher days. Video lessons aren’t just for substitute teachers anymore. Video is becoming an integral part of classroom learning for students around the world. One study found that 46% of teachers have made at least one video lesson. In Australia, the curriculum now includes greater emphasis on creating multimedia projects. Given that more than 500 million hours of video are watched on YouTube each day, it’s no wonder video is becoming central to learning and creative development. You may have seen our guide for teachers on How to Make Educational Videos. Why stop there? Let your students do the creating! Video consumption is on the rise, and students can benefit from mastering basic video creation skills. YouTube has over a billion users, almost one-third of total internet users. For high schoolers, video development and creation will be an essential skill for college and the workforce. For younger students, making videos can help with creative development and offers a platform for self-expression. 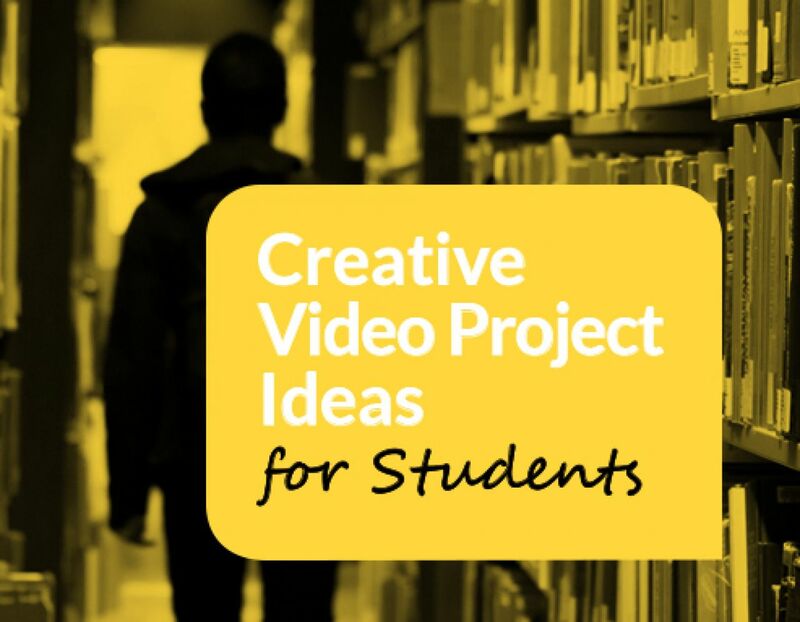 Here are some ideas for video projects for students of all ages. Elementary school students generally have short attention spans. Video projects are a great way to engage younger students for longer stints. If a video is produced by their peers, interest will skyrocket. Video projects also offer a new way for students to explore their creative side. Here are some of our favorite creative video project ideas. Ask students to design a movie-style trailer that excites their classmates about a novel or a non-fiction book. Instead of a traditional book report, students will have the opportunity to think creatively, share a story with their classmates, and expand their reading skills. Students can create a video showing off a significant location or their favorite classroom. If you have a field trip planned, ask students to share their experience by recording a video of the day and add some voice over narration. Alternately, if your budget is too tight for a field trip, a student-led tour of the school is a great way to share the campus with potential new students and visitors. No matter the time of year, there’s always something to celebrate. Have your students film a letter to Santa, make video Valentines for parents or grandparents, or just create digital thank-you notes for classroom visitors! Learning about historical people and events? Have your students research and recreate major moments in history, like the story of Rosa Parks or the Oregon Trail. Videos will help other students visualize and remember these important moments. It also gives students the opportunity to experiment with digital storytelling. Because these events actually happened, students will be challenged to bring each scene to life accurately. Video learning isn’t limited to literary or historical topics. Encourage students to use stop-motion or create their own slides to explain science experiments or arts and crafts projects. Biteable also has a Claymation template which can be customized for various how-to or explainer videos perfect for younger kids. Video projects for high schoolers can be a little more advanced, as students should be practicing editing and narrative skills in addition to learning about new topics. Ask your students to film a news broadcast — covering both local and international events - to give them a chance to learn about the rest of the world. Ask your students to take on certain roles in the newsroom: anchor, sports reporter, weather reporter, or entertainment correspondent. Doing a news segment gives everyone a chance to get involved. Rather than asking for a traditional essay, have the students do some research about a local or international cause they would like to highlight. Many high school students will be thinking about college applications. Give them the chance to jumpstart their applications with a portfolio video project. Using a template like Biteable’s Artist Portfolio, students can showcase what makes them unique. Art students can show off their best work and design skills while the rest could answer a traditional application question. This project is great for incoming freshmen. At the beginning of the year, ask them to create videos with questions for their future self, or with their goals for their life and career. At graduation, you can send the videos back to them. It’s a fun, positive way to celebrate their success throughout high school! No matter what form your classroom video projects take, Biteable has tons of easy to use templates your students can customize — all for free! Take a peek at our library for more inspiration.